Lisa Randolph knows cotton. She's married to a cotton farmer and lives on a cotton ranch. She hand picks, cleans and gins some of that cotton especially for hand spinning, so that it's as spotless and white as it can be. Yesterday she attended a cotton spinning class down near Waco at Homestead Heritage, and brought us some fantastic samples of their class work to the LRB today. 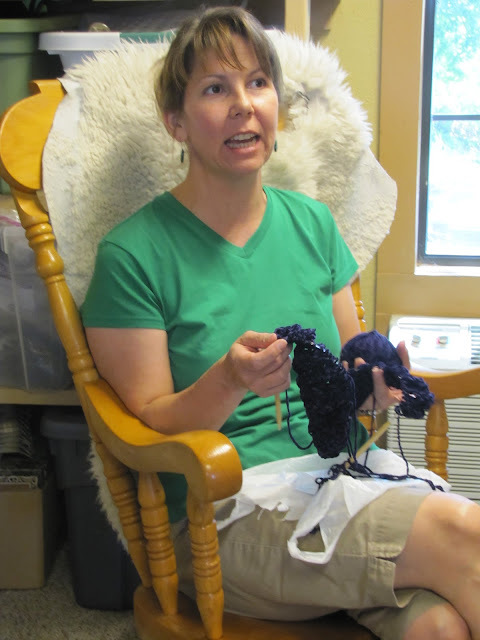 That colored cotton is amazing - I learned today that if you boil the green cotton after it is spun, the color darkens and intensifies, permanently. It's one of my favorite colors of all. 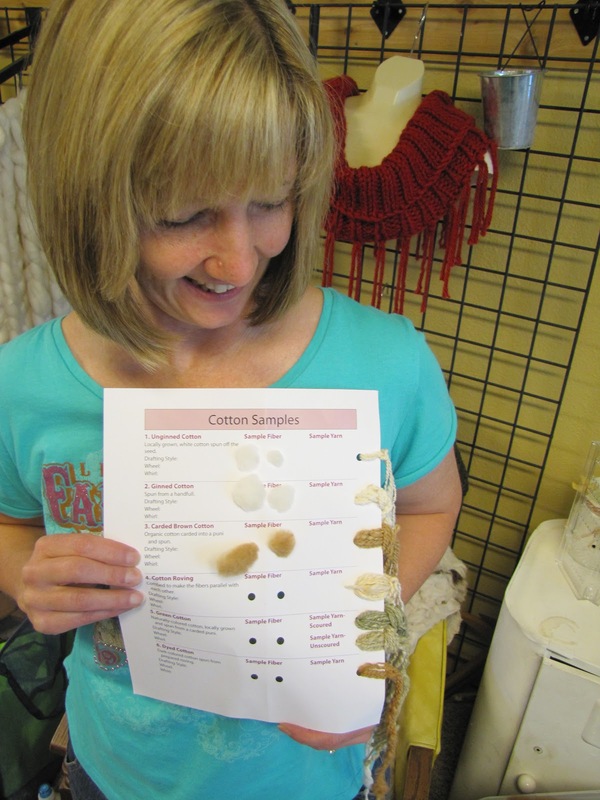 I asked Lisa if she'd give us just a quick tutorial on carding cotton and rolling punis (poo-nees). 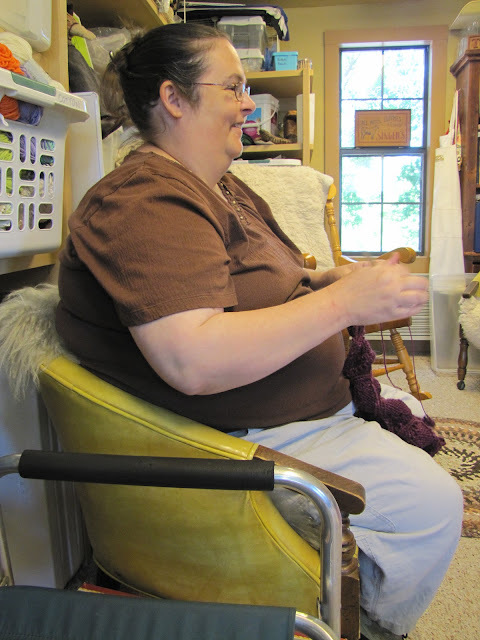 I hope to practice a little cotton spinning with the pile of punis she made for me out of her pretty white cotton. She carded the cotton very much like we would card wool, but her cotton cards have more shallow teeth, and the shape of the cards is a narrower, longer rectangle. Once the cotton is carded, she rolls it onto a dowel to form the puni. Some people prefer their punis tighter and some looser. Looks like I'm going to have to experiment a bit to come up with a preference. She finished by sort of "burnishing" the puni on the last row of carding teeth. 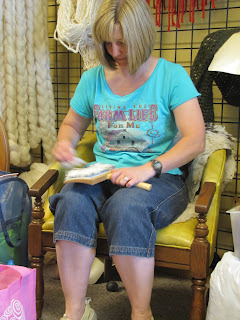 Carding in itself can be a relaxing way to play with cotton fiber. I am anxious to try my hand at the spinning, since I'm much more comfortable with a long-draw style than I was the first time I tried to spin cotton. Hanane and Hassan were also able to join us and hang out. Hassan either is one very patient husband, or he secretly enjoys all the ladies and the fiber talk. Sure, it looks like he's absorbed in something on his iPad, but we all know better. Rita got a bunch more rows worked on this gift for one of her bridesmaids - our own Brenda G. Isn't it lovely? Can't wait to see it finished and blocked. Here's the pattern on Ravelry, so you can see one finished. We had a great special Fifth Saturday together. Even saw Gail for a split second - she dropped off a fruit tray and vanished. Lisa - have a safe trip home and keep in touch! We're still praying for rain for the Lubbock area. Those cotton seeds need a long, tall drink of water!